Coming up with new ways (that don’t break the bank!) 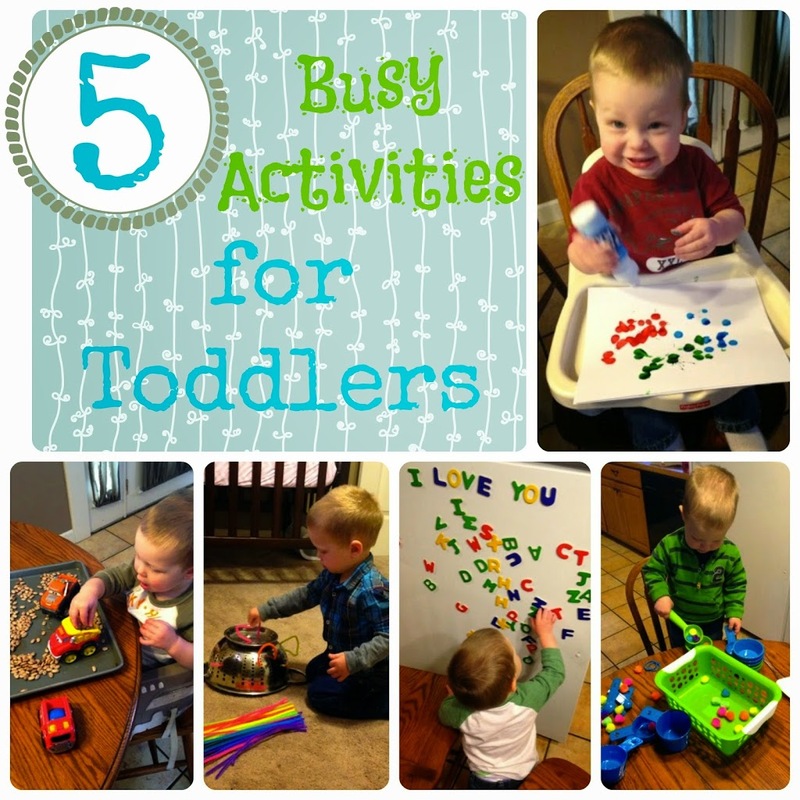 to keep toddlers busy can be tough sometimes. I’ve been experimenting with a few activities over the last few months and I thought I would share my favorites. Walker LOVES this. I have to coach him to be gentle though so he doesn’t make holes in the paper, but this is for sure a big hit. One day I drew “I love Daddy” on a piece of paper and let Walker decorate it to give to him. Also, it’s a great activity for learning colors. I bought our dot paint set at Wal-Mart for around five bucks. I went to Dollar Tree and bought several kitchen spoons, cups, etc and also some pom pons. I keep this basket in the kitchen and pull it out when I need Walker to be entertained for a bit. He loves scooping up the pom pons and stacking the cups. This is also a great activity for color sorting. 3. Gravel PitWhat boy wouldn’t want to run their trucks around on a pile of dried beans? (Or rice or pasta or whatever you have on hand.) Walker enjoyed this and even ate a few beans in the process. Yuck. *I’ve since been told that dried beans can be toxic so it’s best to stick with rice. 4. Magnetic LettersI bought these magnetic letters at Dollar Tree and Walker really likes when I pull them out. It’s a great fine motor activity and also great for learning colors and letters. 5. Pipe Cleaner FunI found this activity on Pinterest and Walker really enjoys it. Basically you just turn a strainer upside-down and show your toddler how to put the pipe cleaners through the holes. It’s a great fine motor activity and can also be used for color recognition. Oh and guess where I got the pipe cleaners? Yup. Dollar Tree. Good to know! He only ate like 2 and this was months ago, but I won't let him again! Thanks for sharing! -We have a big bin of colored rice (easy to make) and M likes to hide alphabet letters or small toys in there and dig, scoop, etc. I spread a huge beach towel on the floor and it contains the mess! -We just got some kinetic sand to try..very cool stuff! I'm going to make an indoor sand bin for her to play with. -stringing Cheerios on pipe cleaners..good for fine motor!